The Philadelphia Eagles, having arguably the most complete roster in the NFL, did what basically only they can do: make a gamble with each and every one of their picks. A couple of their draft picks have never played Division I college football, one is among the most undersized at his position, while one of them has injury concerns. As such, nearly all the Eagles’ picks have the potential to perform by far above their draft position, especially since only one of their selections cost them a draft slot inside the top 120 selections. However, even if some of Philadelphia’s picks pay off and turn into consistent contributors or even starters, this is unlikely to happen early in their careers as all five players will need significant time to adjust to the NFL. Being the defending Super Bowl champions and having made multiple key additions during the offseason, this is definitely not a problem for the Eagles as they do not need their draft selections to contribute immediately. For even more information on who the Eagles drafted and possibly some undrafted free agent players who could make the team, grab a copy of our 2018 NFL Draft Guide with expanded profiles, scouting reports, PFF signature stats and extensive details on over 300 players you cannot find anywhere else. 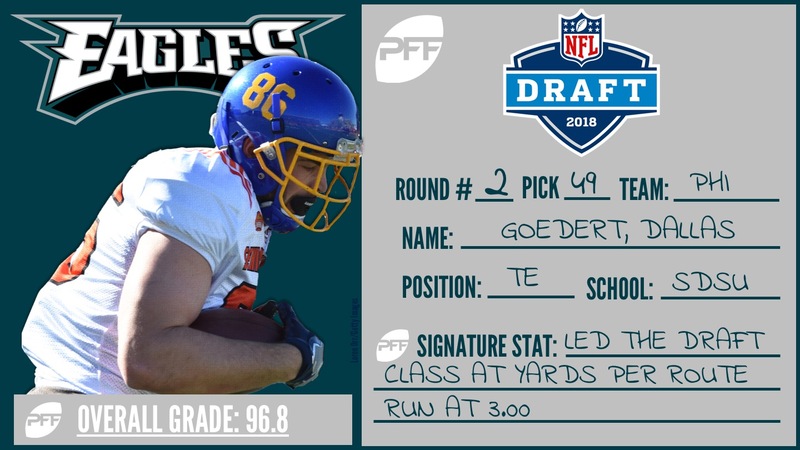 PFF’s top tight end prospect, Goedert dominated at the FCS level in 2017 as his overall grade was the highest among all tight ends. Although he played at a lower level, plenty of what Goedert put on film can easily translate to the NFL. The former South Dakota State Jackrabbit demonstrated very good athletic ability and was heavily involved on screen plays, which you rarely see with players who have Goedert’s frame. Having lost Trey Burton in free agency to Chicago, Philadelphia might have already found his replacement in Goedert. While run-blocking was not Goedert’s forte at South Dakota State, an improvement in that facet of the game could speed up how quickly he finds his way in the lineup as the Eagles are currently lacking a tight end who could contribute in the running game at a high level.